This Ultimate Foodie Gift Guide is the best place to find the perfect present for that kitchen gadget loving person in your life! 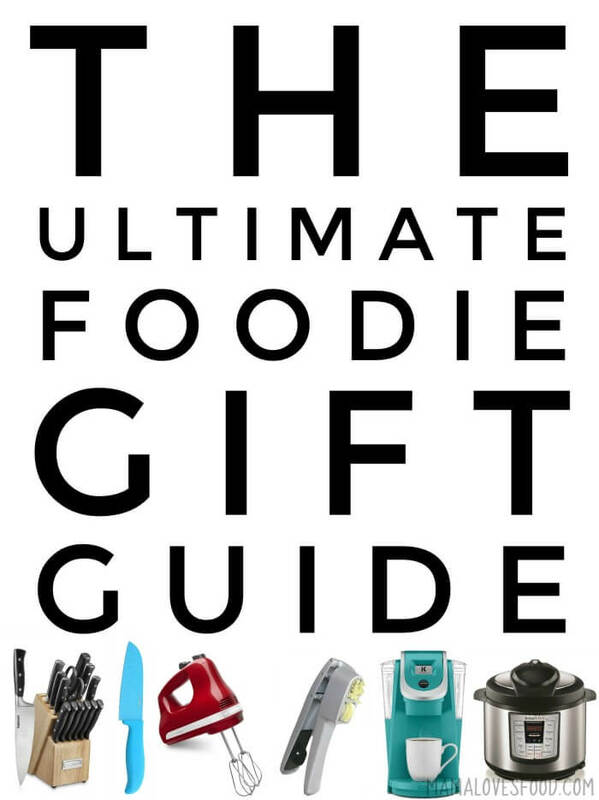 Oh, we’ve worked hard on this foodie gift guide! If you watch our twice weekly live show (you do watch, right?! 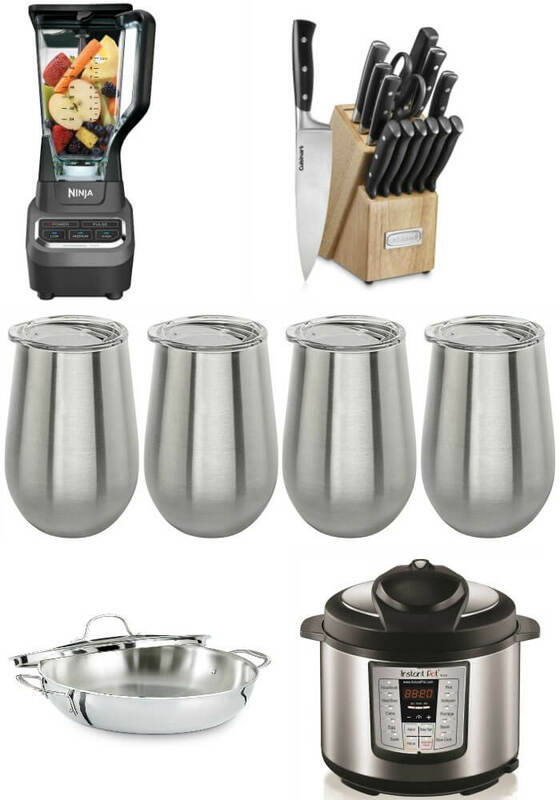 ), you know that I absolutely adore kitchen gadgets. 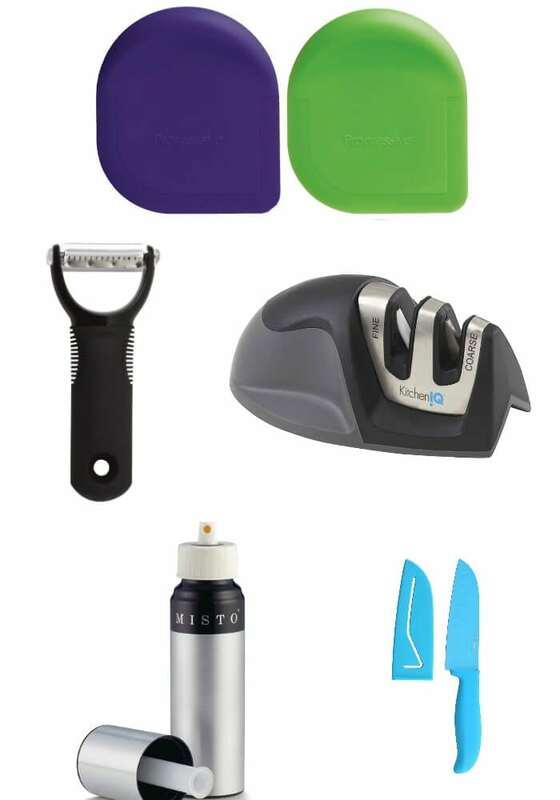 Love love love kitchen gadgets! But not just anything. We have a smallish kitchen and lots of people in my house, so if we’re going to add something new to the mix it had better be fantastic! 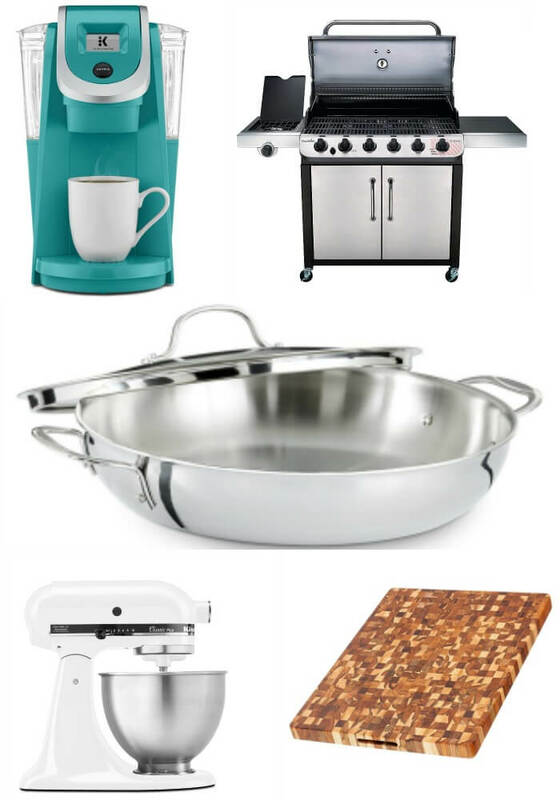 This list is comprised of my absolute favorite kitchen items. Things that make life easier and more fun when it comes to food and cooking. And any time it’s possible, things that are bright, colorful, and cheerful! Dish scraper – I know, I know. There is absolutely nothing glamorous about a dish scraper. But it’s one of the best things you can have sitting on the sink ledge! Makes a great stocking stuffer. This little gadget makes quick work of anything stuck onto pots, pans, and plates! 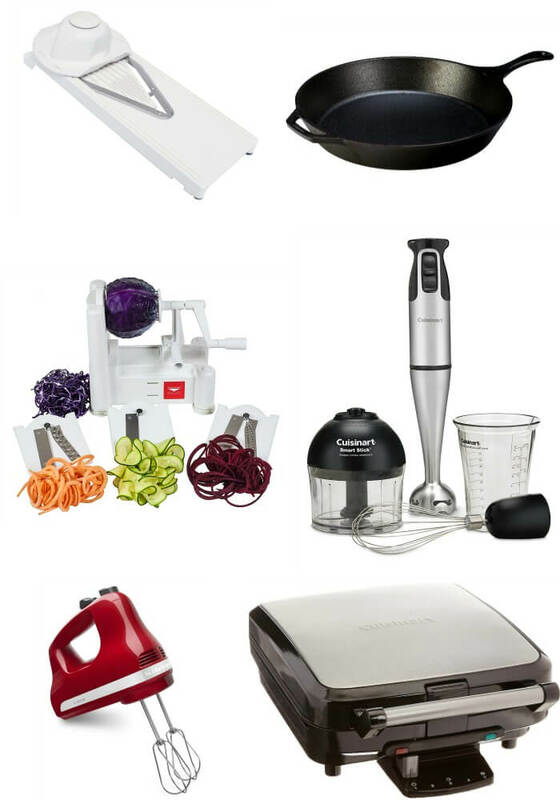 Julienne peeler – Want to make some super quick zucchini noodles for one, or quickly shred some carrots for your salad? This julienne peeler is the perfect solution! Great for folks in apartments or small spaces too. Five layer cake pans – These cake pans are so much fun! They make a five layer cake out of one box cake mix. All five will fit in the oven at once, and they cook in about 1/3 the time of a normal cake! Have I mentioned they’re so much fun?! See them in action with our Chocolate Overload Cake. Cookie stamps – I don’t make a whole lot of cookies, but when I do, we love to pull out our cookie stamps! If you’re making shortbread style cookies that don’t spread, you can stamp them beforehand. If you’re making more traditional cookies, stamp them as soon as they come out of the oven while they’re still soft and hot! Bundt pan – Using a bundt pan is the best way to make any cake look fancy and fabulous. Doesn’t matter if it’s a straight out of the box cake mix with canned icing – this bundt pan will make it look grade A! 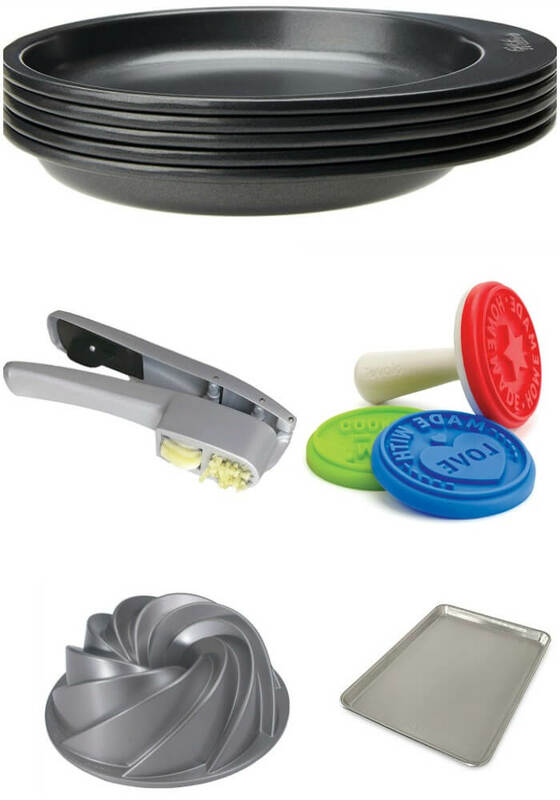 Mandolin slicer – Make pickle slices, or scalloped potatoes. French fries, and shaved onion. You won’t get a better or quicker thin slice than with this mandolin. Just make sure to use the safety guard, no one *actually* wants a knuckle sandwich! Spiralizer – Even if the only thing I ever made with this was zoodles (zucchini noodles), it would be 100% worth the cabinet space. Thankfully though, it’s not the only thing I make. My kids love spiralized apples, and hubby and I are partial to curly fries! Belgium waffle maker – This electric waffle maker makes four gorgeous perfect fluffy waffles. Mmmmmmm. We suggest you break yours in with this yummy pumpkin spice waffle recipe! Ninja blender – We. Love. This. Blender. It blends all the things! Beautifully! No scraping the sides like I did in my old blender. And for a super reasonable price. My favorite thing to blend is Strawberry Lime Slushes! Double wall insulated wine glasses – Okay, this one’s not really a gadget so much as something I find really useful in a hot kitchen. I can pour my cold wine or beer into one of these cute glasses and forget I did for hours. When I finally wander back, it’s still cold and ready for me. I’ve even sat it next to my flaming hot grill while I make burgers, and it doesn’t turn into warm beer soup! Keurig coffee maker – Confession: we actually have two Keurig’s in our house. One in the kitchen and one in the office. This single brew machine makes a damn fine cup of coffee, and quickly. Also, it’s super cute. Mine are turqouise (in the office) and retro blue (in the kitchen). 6 Burner gas grill – For Christmas last year we upgraded and gifted ourselves a 6 burner gas grill. It seemed like overkill at first, I mean it’s really really big. But oh my goodness, it’s been the most amazing thing! I love piling up the grill on Sunday afternoon with three or four different proteins and cooking a week’s worth of meat all in one swoop. It’s so convenient and there’s nothing like cooking outside and enjoying a cold beer. If you follow my snapchat, you know I’m out there a lot! Le Creuset braising pan – We talked a little bit about this one already. It’s the pumped up version of the Calphalon everyday pan. A little heavier, a little taller, a little nicer. And if you have a little more money to spend, then this is for sure the one to get. It’s a beautiful pan that you’ll use day in and day out. Classic Kitchenaid stand mixer – Save the best for last? Or at least the most grand. I don’t know why, but a kitchen just doesn’t feel like a kitchen without one of these bad boys tucked away on the counter. My favorite things to make in ours are ginger cookies, no churn ice cream, and shredded chicken. Yup, seriously. The Kitchenaid shreds chicken like no ones business! I love this list!! I would replace the kindle with the new Nook but other than that I want everything on this list!!! I will be sending links to this in my Birthday invitations!! What an awesome list! Love it. Might have to show it to anyone thinking of getting me something for gifts. Thanks for this great list. Some of your favorite things are mine as well. A well equiped kitchen makes cooking so much more fun! This list is great and super helpful! great list! thanks for posting! This is awesome April! I love it. can’t wait to get shopping! that grill looks fantastic! Awesome list!!! Definitely gonna use some. link to the instapot is not working… Just to let you know.